The Aircraft - Where are they now? In 1976 Caribou (CV2) 57-3080 was assigned to the Silver Eagles as a support aircraft to replace two UH-1 from the school fleet. 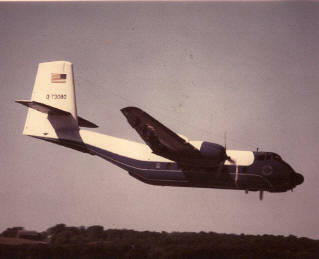 The Caribou was used to transport aircraft parts and the support team to and from show site. The Aviation School provided crew for the Caribou. At most show sites, the aircraft was put on static display and the crew greeted spectators and answered their questions about the aircraft. For its support role, the aircraft was given a unique blue and white paint job. The aircraft has now been painted olive-drab and is parked in front of the Army Aviation Museum in Ft. Rucker. On a personal note - I (Ben Powell) was assigned to fly 3080 for the Advanced Research Projects Agency (ARPA) in Vietnam in 1963/64. I also flew it to Borneo - but that's another story.